We pride ourselves on our classical training as well as our dedication to staying up-to-date with the latest in hair trends. Whether you need a simple cut, a new color or a special updo for a wedding or graduation, our skilled stylists are ready to help. We welcome women of all ages and hair types to our salon. A new hair color can give you a new outlook, dramatically change your appearance and make you look younger. Whether you want all-over color, full or partial highlights or a trendy look like ombre, balayage or color melt, we have you covered. Or, come in for a quick root retouch to keep colored hair looking natural. The Brazilian Blowout has swept the nation over the last few years. Our salon is certified in this special technique. 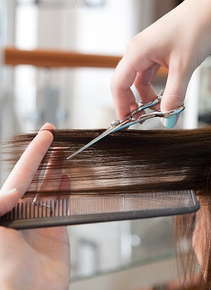 We also offer keratin straightening, deep conditioning and re-texturizing. If your hair is feeling brittle and damaged from too much chemical processing, we can make it soft again. We love brides, prom queens and birthday girls, whether you are turning 16 or 80. We are happy to do hair, nails and makeup for your entire bridal party. Or, consider hosting a girls’ night out at our salon, complete with champagne and pampering for you and your best friends. Whatever your hair needs are, we are happy to help you achieve your aesthetic goals. Call us today to schedule an appointment.